Last month, designs were revealed for the new 60,000-seat Perth Stadium. The architectural collaboration between HASSELL, Cox Architecture and HKS is set to be about much more than sports, incorporating an entirely new precinct to link the city with the Swan River. Part of the new precinct includes a $358-million ‘smart transport solution’ underneath the stadium, including a new train station. Perth Station Stadium is set to be the second biggest station on the Transperth network. HASSELL was awarded the $5.5-million contract for the Perth Stadium Station design in 2014. 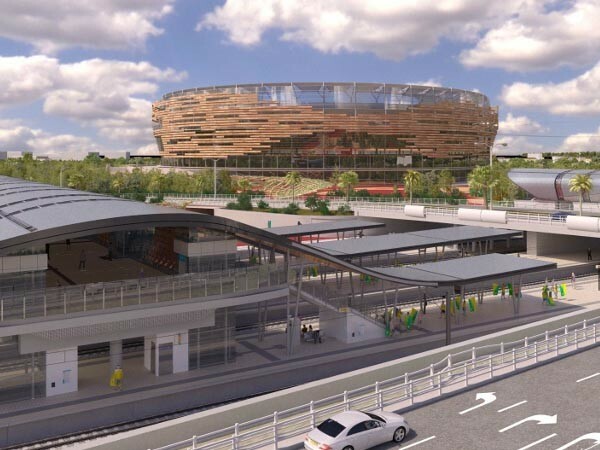 The new station will service the stadium precinct with three island platforms that, together, will have the capacity to move up to 28,000 people per hour after an event. These platforms will be connected by both lift services and pedestrian concourses. On the ground level, the station will incorporate a broad roof structure to provide weather protection to users. The new station is currently being constructed on the former Belmont Park Station site. It is set to open in early 2018.